Should Germany Help Bail Out GM? When Karl-Theodor zu Guttenberg jets into Washington this Sunday he plans on asking some tough questions. Germany's new Economy Minister is due to meet U.S. Treasury Secretary Timothy Geithner and bosses at embattled American carmaker General Motors. Opel, a Germany-based division of GM, is fast running out of cash and GM and Opel bosses recently went cap in hand to Berlin to ask for $4.25 billion in state aid. In return, GM say they will restructure Opel by cutting costs and loosening the company's ties with the parent company in Detroit. Opel would become an autonomous legal entity, half of which could end up in the hands of private investors. The question is: should German taxpayers help out America's biggest carmaker? The job of deciding whether to trust GM falls to Zu Guttenberg, who took up his new job just four weeks ago. At 37, he's the youngest economy minister in Germany's post-war history and already he's being hailed as one of the country's most popular politicians. With his slicked-back hair, and boyish good looks, Zu Guttenberg exudes the one thing which most German politicians lack: charisma. Unlike his predecessor Michael Glos, a 64 year-old political veteran who shied away from the cameras, Zu Guttenberg has gone on a major media offensive. While his blue blood credentials are unquestioned, Zu Guttenberg is a novice when it comes to economics. He's worked as chief executive of his family's company, Guttenberg GmbH, which looks after the family's investments, but, apart from that, the minister doesn't have much of a proven track record in economic issues. "Mr Guttenberg's biggest challenge is how to develop concepts to deal with the recession. Up until now, the Economics Ministry has failed to do this," Gustav Horn, the director of Duesseldorf's Macroeconomic Policy Institute says. "Mr Guttenberg is a good PR man  he's not an economic policy expert. The minister will have to decide what to do with the ongoing economic crisis and he's bound to come under growing pressure to introduce another fiscal stimulus package." But the man sometimes dubbed 'Franconia's Obama' doesn't seem daunted by his new job, even as Germans sink into a period of national soul-searching. 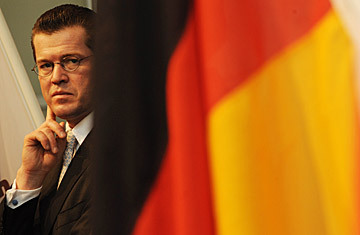 "Let's not kid ourselves, we're in the middle of a tough crisis, but we've now got a very good stimulus plan," Zu Guttenberg told Germany's Bild newspaper recently. "We expect the economy will pick up this autumn, at the very latest." The next few days will decide whether Opel will be part of that resurgence  and how. Read a TIME story on Germany's auto industry.